The adventure starts in Meaux, within the company Ultrasonic. The first patents are filed for measuring flows using transit time difference or ultrasound wave difference. The first prototype is created on the basis of an NDT machine already equipped with an integrated oscilloscope display and original signal processing. A partnership is set up with Trapil (pipeline operator). The first interface detector, the M212, is developed. Mr Jacques Pierrat (CEO of Ultrasonic) creates the company Ultraflux. The M211, the first portable Tracking Window on the market, is released. Ultraflux becomes a totally separate entity to Ultrasonic. Ultraflux opens its head office in Poissy (April), with 5 people working at the site. The first measurements are taken on rivers in Gourney-sur-Marne. The UF 320 P is launched: the first portable device on the market with a digital interface. It is hugely successful. The first sphere detectors are developed and sold. An electronic card is developed around a microprocessor – all mounted on the UF 321. Olivier Pierrat, the son of Jacques Pierrat, takes over from his father at the head of Ultraflux. 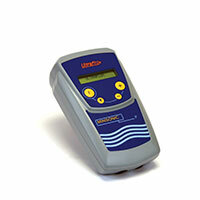 The UF 2100 is released: this device uses up to 4 chords to measure flow rate. It is released in several versions: CO (Open Channel), RV (River) and MC (Multi-chord for Pipes). A NL (Liquid Level) version of the UF 2100 is developed and a patent is filed with Géostock to measure the level of (liquid) gas in a cavern. The DigiSonic P is released: the first flow meter equipped with a DSP (Digital Signal Processor) to digitally process the ultrasound signal. USE (ULTRAFLUX SERVIÇOS E EQUIPAMENTOS) is set up in Rio de Janeiro, Brazil. The Minisonic 600, a fixed flow meter to measure pipes with a diameter of up to 630 mm, is launched. This flagship product is still sold by Ultraflux. The portable Minisonic P model is released, with its exclusive, acoustic signal optimising technology using ESC (Echo Shape Control). The portable flow meter Uf 801 P is launched. USEA (ULTRAFLUX SERVICES AND EQUIPMENT ASIA) is set up in Bangkok, Thailand. Takeover of Ultraflux by Société des Domaines, independent family group. The Uf 831 is released, enabling flow rate measurements to be taken for 1 to 8 pipes with the possibility of incorporating up to 8 speed chords. The Ultraflux head office is moved from Poissy (Yvelines) to Éragny-sur-Oise (Val d’Oise). The new Ultraflux visual identity is rolled out. The Uf 811 flow meter is launched in Full Pipe and Open Channel versions. Set up pf an ultra-modern test laboratory in Ultraflux head office. The Uf 821 is released, a fixed flow meter authorising up to 4 measurement chords and available in Full Pipe or Open Channel versions.